"I've used your Potatoes drANNAn Recipe countless times." And 1 1/2 Hours of 350° Oven Time. A Lifetime of Healthy, Trouble-Free Broiling and Roasting. be as ideal as it claims, but still better than the usual broiler pans. promised a money-back guarantee, it was a low-risk experiment. It turned out that the pan delivered everything it claimed. I used to avoid broiling due to the mess and smoke. spokesperson for the product...just a converted skeptic." I Say is True Without Risking One Cent. IF YOU DON'T FALL IN LOVE WITH THIS PAN. There is Only One Condition. The Pan MUST be Returned in USED Condition! I Know You Won't Give It Up for Anything..
Moist and Ta stier than Ever." "My husband LOVES it. Easy to Clean. Steaks were Great. Best Hamburgers in the World. Steaks. Prime Rib. Beef Tenderloin. Roast Chicken, Turkey, Cornish Hens. Lamb Chops. Pork Loin. Salmon. Roasted Potatoes, Onions, Carrots, Garlic, Squash, Turnips, Eggplant, Fennel, Peppers, Tomatoes. That don't use the WaterBroiler Pan. The Pan, The Rack, and The Tongs Clean Beautifully IN Your Dishwasher, too. Which Makes it Work "1000 Times Better"
Will be Included with Your WaterBroiler-WaterRoaster Pan. The Recipes are Simple to Make and Simply Delicious. Your Prep Time in Most Cases is a Few Seconds or a Few Minutes. "I've used your Potatoes drANNAn Recipe Countless Times"
I changed the Pommes Anna Recipe to be healthier by using Extra Virgin Olive Oil Instead of Butter. I couldn't resist naming them after myself after I noticed that the middle part of my middle name, DrANNAn, spells ANNA. Many cooks have written that my very easy, delicious recipes are worth the price of The Pan. I hope you write, too. It will make my day! The Most Trouble-Free Cooking Pan Ever Created. I have never paid for an endorsement. I didn't need to. It would be against my scruples to ever pay for a testimonial. to use their names and quotes without any compensation. $75.00 with FREE SHIPPING To All 50 States and U.S. Territories. Ohio Residents ONLY will be charged 7.25% Sales Tax. By International First Class Mail. Through PayPal after Paying $75.00 for the Set. Email Us for the Shipping Cost to Other Countries. Drannan Cookware is The Sole Source for My Pan. It is NOT Available Anywhere Else. Credit or Debit Card Without Creating a PayPal Account. credit card statement as"PayPal-Drannan Cookware." You can also mail us a check or order by phone. which you can pay with a Debit/Credit Card OR with a PayPal Account. Phone Toll Free Phone: 1-800-227-7066. Feel Free To Phone Us If You Have Any Questions. Email us for shipping costs to other countries. increased to more than my selling price a few years ago. A Mirror Finish just like they were made in the U.S.A.
© 1975-2019 by Lee Drannan Smithson. All rights reserved. "Works just as described. My husband LOVES the WaterBroiler Pan. Easy to Clean. Steaks were Great." 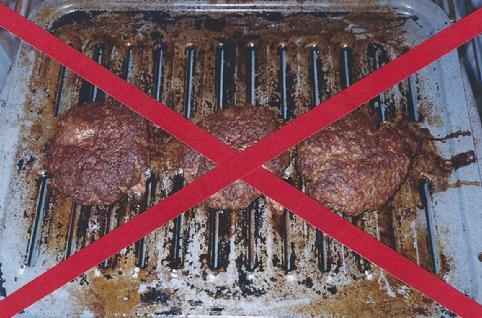 That You Can Now Broil Hamburgers with No Smoke! No Splatter! No Flare-ups! No Exhaust Hood Needed! So You Can See The Proof in the Two Minute Video. The WaterBroiler Pan is Still Under Your Oven Broiler! having to pull the pan out from under the broiler." The Rack is Right. The Metal is Right. The Shape is Right. The Size is Right. The Handles are Right. Most Broiler Pans Don't Even Have Handles!! Common Broiler Pans is The Main Broiling Culprit. spaced small holes or slots. It was a hellish design from the Git-Go. Hot and Smoke, Splatter, Flare-up, and Burn into Tenacious Black Char. the drippings to Instantly Drop through the rack into the drip (Drop) Pan. Absolutely no smoke, no splatter, and no flare-ups come from this rack. No Flare-ups, but the drippings slightly stuck to the drip pan. into the pan Before Broiling and Roasting to prevent the sticking? like a breeze. The water slightly evaporated (did NOT steam) when broiling. amount of moisture to the oven to keep the food juicy and succulent. 18/8 Stainless Steel for More than Beauty and Endurance. broiler-roaster pan that does NOT need to get HOT to cook perfectly. good heat conducting aluminum, black porcelain steel, or clad metals.. Buyer Beware when Buying 'Stainless Steel' Cookware! 'Stainless Steel' based on Chemical Composition! definition is NOT good for Cookware. It is reactive to acidic food. 18/8 Stainless Steel contains at least 18% Chromium and 8% Nickel. 18/10 Stainless Steel contains at least 18% Chromium and 10% Nickel. in nickel composition are permitted which makes them practically identical. A magnet will STICK to Cheap Stainless Steel that contains No Nickel. If a magnet sticks, you got stuck with cheap stainless steel. A magnet will NOT STICK to Expensive 18/8 and 18/10 Stainless Steel. 12 inch Round Pan is Thoughtfully Designed To Fit IN Divided Sinks. To Fit IN Dishracks. To Fit IN Dishwashers. And, To Hang Beautifully on your Potrack for Daily Access. "Used 11 times the first week! Helps my diet." Pan (not including handles) is the perfect size for most households. Half-a-Ham, An 11 Pound Turkey, or a Pork Crown Roast with 14 Chops.. It's so Easy to Use and Clean, it's also Perfect for Singles and Couples. Most broiler pans don't even have handles! The WaterBroiler-WaterRoaster Pan Where They Belong. Some foolish broiler pans have handles on the rack! handles which are difficult to lift-up without burning your fingers. While the Frozen Center Prevents the Center from Overcooking! The 1/2 Inch Center of 1" Steaks Cook Perfectly...Medium Rare. And a 1" thick New York Strip (aka Boneless Top Loin). Broil seven minutes until Crispy Brown. Turn and continue broiling for six more minutes. You Will Freeze All Your Steaks Before Broiling. Convenience, but Cook them Well-Done. It is NOT Safe to eat Rare or Medium Rare Hamburgers! Imagine The Ease and Convenience. potatoes and making a salad and setting the table. You can be sitting down to a steak dinner in about 29 Minutes. Add One Minute to CLEAN the WaterBroiler Pan. About the Cost of One Steak Dinner in a Fine Restaurant. "Perfect! Used for 1st time, Clean up a breeze. "The WaterBroiler is fantastic! I am so glad I bought it." "Excellent time saving, taste enhancing product at excellent price!" "Way better than that huge thing that came free with my stove! Love it." "Unbelievable product, better than advertised." "Why are you keeping this wonderful product such a secret? All 50 States and U.S. Territories. Or With a Debit/Credit Card. make life easier for home cooks. Lee Drannan Smithson calls himself a scientist. An inventor. the former chemist smashes some of the prevailing wisdom of home cooks." "Wow. We're Speechless. We LOVE the Pan. You are a Genius!" Cookware Design, You'd Get My Vote!" Steel Broiler-Roaster Pan Cleans in a Minute. No More Smoke Alarms. No More Exhaust Hood. No More Scrubbing. To Solve All Your Hateful Broiling and Roasting Problems! "1000 times better than the broiler pan that came free with my oven." "Great product. What a relief it is to junk my old broiler pan!" kitchen or having to clean the oven." Retired Chef who hates doing dishes." "The Absolute Best Broiler Pan"
"The Best Roasting Pan You Will Ever Buy." Problems That Has Plagued Cooks for Over 100 Years! The Common Broiler Pan IS The Broiling Culprit. Not Broiling! The Common Roasting Pan IS The Roasting Culprit. Not Roasting! And The Reason Why 150 Million American Cooks Hate to Broil. Here's Why Common Broiler Pans Cause ALL Broiling Problems. The Rack is Wrong. The Metal is Wrong. The Shape is Wrong. The Size is Wrong. Here's How I Made that Shocking Cooking Discovery. Organic Materials are Burned or Heated to a High Temperature! could be carcinogenic, and I Stopped Grilling and Started To Broil. Old-Style Broiler Pan Could be Improved. I watched hamburgers as they broiled on that old broiler pan above. That Simple Experiment Opened My Eyes to The Broiling Culprit. Here's What I Saw...And What I Did NOT See. Came Directly from the Hamburgers! The Hamburgers, per se, were Totally Innocent. That Perforated Sheet Metal Rack with a few "drip" holes. I could barely restrain myself from Shouting, "Eureka!!" Quickly get HOT and Burn the Drippings into Black Char. Scrub-Free Easy Cleaning Broiler-Roaster Pan. *I invented this pan in 1967. Production Started in 1975. Nightmare Into A Lovable Cooking Dream Come True. With No More Smoke in Your Kitchen. No More Noisy Exhaust Hood. No More Oven Splatters. No More Flare-ups. No More Scrubbing Ever Again. My Forkula® Tongs invention is also Revolutionary. The WaterBroiler Pan While The Pan is Still Under Your Oven Broiler! No More Chasing Hamburgers with a Pancake Spatula! The Forkula® also works equally well as a stand-alone BBQ Tool. The Forkula® is being used to turn a hamburger on a Weber Grill below. violent and disgusting by "ill-conceived" pans. Lee Drannan Smithson, a chemist now living in Dayton, Ohio. consumers, one by one, via direct mail and website ever since. from not doing what other pans have done. no burbling, no sizzling, no screeching of the smoke alarm. just a trip through the dishwasher's regular cycle. product, ubiquitous as the colander, explains a lot about design. supposed to look like, it can't compete in the big marketplace. A product that needs explaining, like his, is a hard sell. is still alive and well, cooking silent burgers in Ohio." flare-ups, and worst of all...cleaning the pan afterwards! Now that I have a WaterBroiler, I use my broiler all the time! No smoke, no flare-ups, and clean-up is too easy! most of us never use it! With this pan you will use it a lot! I LOVE this pan! Awesome results with the easiest clean-up ever! awesome pans, and I plan to buy more as they make wonderful gifts. My hats off to Mr. Smithson and The Drannan WaterBroiler!" With Virtually No Effort...Even IF You are a Novice Cook. not only for broiling but for a variety of things." "I LOVE the WaterBroiler Pan. It made a great cook out of me." good cook. I don't know how I've lived this long without this pan. to beat this." Mrs. O'Brien, Boca Raton, Florida. "I LOVE this pan. Awesome Results with the easiest clean-up ever." "The WaterBroiler Pan is Fantastic. A Must Have Item." "Got it. Used it. Cleaned it. Loved it. Worth every penny." "Fantastic product. Cooked the best hamburgers ever." "Cooked the best roast chicken we have ever eaten." "I cooked four Cornish game hens for Christmas. We've never tasted juicier poultry." "Why doesn't the whole world know about this pan?" It Couldn't be Easier! It Couldn't be Cleaner! It Could't be Simpler! Broiling and In Your 350° Oven When Roasting. The Pan is NOT designed for stove-top use. Broiling and Roasting. That's about 1/4 inch of COLD Water. 'poor heat conducting' 18/8 Stainless Steel Pan. It takes 2 hours in a 350° Oven for the water to boil. Top of The Rack. Never Cover the Food with Anything. Your 350° Oven, The Ideal Roasting Temperature! The 18/8 Stainless Steel Wire Rack are The Two Essential Secrets. Cold Water is the Third Secret! amount of moisture to the oven to keep food juicy and succulent. Hand Basting is Now a Thing of the Ancient Past! from sticking which makes the drip pan super easy to clean. Easily Cleaned in a Minute with a Dishbrush or Dishcloth. NO STEEL WOOL. NO GREEN PADS. NO SCRUBBING EVER NEEDED. GUARANTEED. The Pan and Rack Also Clean Beautifully In Your Dishwasher! and accomplish the same thing. No, You Can't! "No broiler smoke in the kitchen again last night. The Best Broiler Pan On the Planet. Each time we use it we smile." It minimizes smoke, splatters, and scrubbing"
Over 1000 Texans Love The WaterBroiler®-WaterRoaster™ Pan. "I've waited all my life for a pan like this." "My husband says we may never use a skillet again!" "My husband LOVES your WaterBroiler Pan so much, he now refuses to grill." Now Broil The Best Tasting Steaks From Frozen! No Thawing Advised Nor Needed.